This is our last week of coverage for our second round of our ‘7 Walt Disney World Resorts in 7 Days‘ series! This round we have already visited three value resorts – Art of Animation Resort, All Star Sports Resort and All Star Music Resort, and two moderate resorts – Coronado Springs Resort and Fort Wilderness Cabins & Campground. For our final week, we are moving up even further and covering two deluxe resorts – the Polynesian and Contemporary Resorts. The Polynesian Resort is one of the three resorts located on the monorail line connected to Magic Kingdom. It is also one of the original resorts on Walt Disney World property, dating back to 1971. 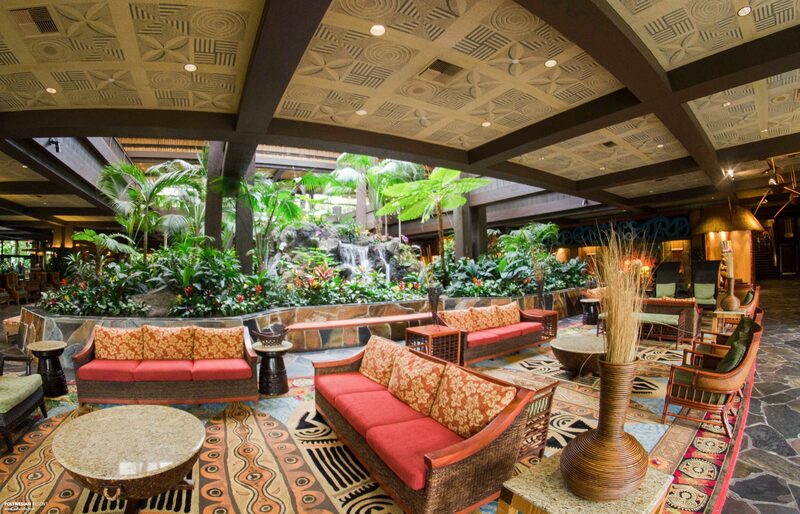 Even though it’s gone through a name change (the resort was originally called The Polynesian Village), The Polynesian Resort is still an amazing example of the original style and theming that made The Vacation Kingdom what it is today. Unfortunately for us, the day we visited Polynesian Resort during our 7 in 7 trip was extremely overcast and grey. This made getting photos of the grounds and pool areas really difficult. Because of this, most of the photos in this blog will be of the great indoor areas in the lobby and rooms. I’ll be honest, there are just as many interesting areas and places to relax inside as there are outdoors. The Great Ceremonial House, in the photo above, is the main building of the resort and houses the lobby as well as the dining and merchandise locations, and some great areas to relax inside. 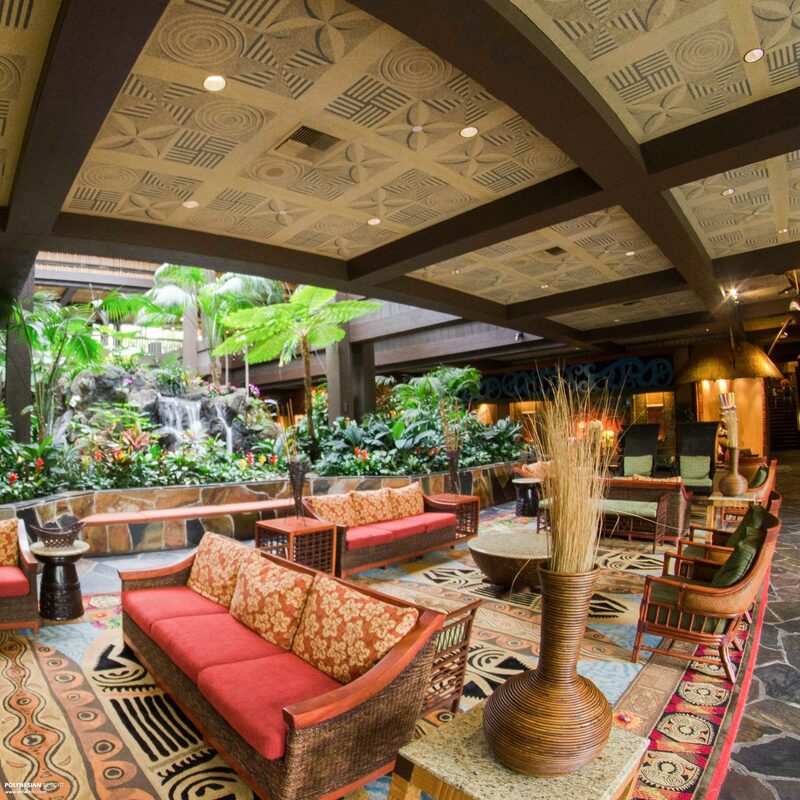 Just like all of the deluxe resorts on property, there are so many details in the Great Ceremonial House that embody the Polynesian Resort’s tropical theme. Wall finishes like textured wallpaper, flat stonework and even some wood paneling add such a high level of immersion. The main centerpiece to the lobby is the huge water feature that is in the dead center of the building. It is directly underneath the large skylights and features an amazing waterfall and a large selection of tropical plants and flowers. In the photo above, you can also see that the floor is tiled with huge slate slabs and there’s even a Hidden Mickey hidden in the pattern just in front of the waterfall. In addition to the details in wallpapers, floor coverings, and furniture, there are also evident Polynesian and tiki influences in the art and sculptures around the resort. This huge Tiki is located in the hallway leading up to Captain Cook’s Snack Co., the resort’s quick service location that is delicious, and is a really fun photo opportunity. There are also some cool tiki statues in the merchandise location on the first floor of the Great Ceremonial House, called “Bou-tiki.” The one above has one hand behind his back and will often times be found holding a shirt behind him. As with the majority of other deluxe resorts, (and even some moderate resorts), there is some fantastic merchandise that is Polynesian Resort specific. T-shirts, mugs, magnets, stickers, and more are all available to buy and are a really nice way to remember your stay and show your Poly pride while back home. Going upstairs is a great way to get a better view of the water feature and foliage down below. It’s also a great way to try some amazing food and have some of the signature Polynesian Resort drinks available. The Polynesian Resort is home to one of the most popular restaurants on Walt Disney World property, ‘Ohana. 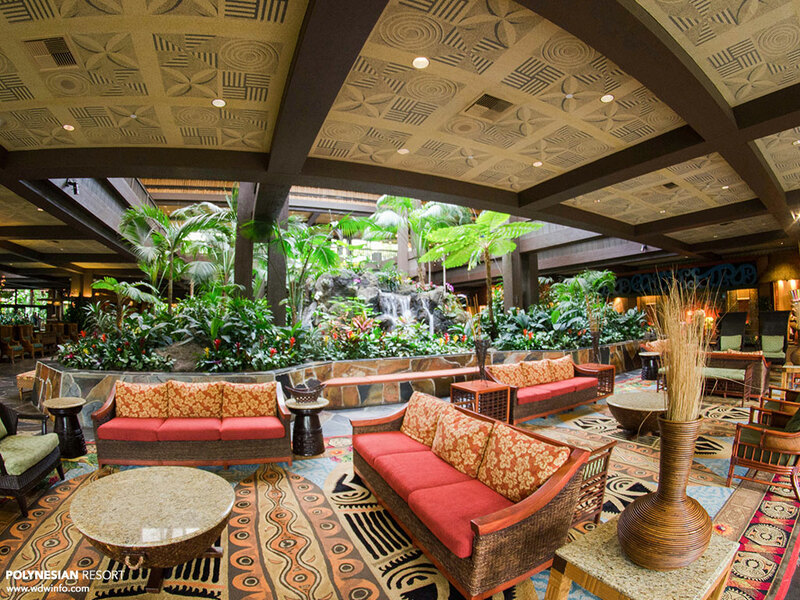 In the entryway to ‘Ohana is the Tambu Lounge which is a really nice bar that offers great views of the resort property and sometimes even parts of Magic Kingdom. ‘Ohana is a family-style restaurant that offers tropical inspired appetizers and salad, and their famous skewers of grilled meats. On the DIS Unplugged, we recently did a review of the restaurant that was not-so-favorable, however in my opinion it is a really fun restaurant that has some good food if you really love an endless supply of fire-grilled meats. Because the day was so overcast while we were visiting, we ended up spending a lot of time in the room. This turned out to be a great way to get a feeling for what it’s like to actually stay at the resort for an extended period of time.We were lucky enough to get one of the newly renovated rooms at the resort and we were pleasantly surprised by the updated decor and the feeling of the room. Similar to the staterooms on Disney Cruise Line, each bed has a pillow on it with different sayings in Hawaiian. It’s a cool feature that is fun to try and guess what each side says. Above is the lamp that on the workstation, which is made of a sort-of-creepy tiki man. Some of the other details that stood out to me were the lamps on either side of the headboard which were made of some kind of raffia, the turtle wallpaper in the bathroom, and the floral bed runner on each of the beds. The shower curtains also have a really interesting pattern on them that is almost feels like an animal print. I thought the new rooms were beautiful. We have photos of the new rooms on The DIS in our full Polynesian Resort gallery. That will do it for our ‘7 Walt Disney World Resorts in 7 Days‘ coverage of the Polynesian Resort! We have a lot of photos of the outdoor areas including the pool, hammocks, and beaches in our gallery. I’ll leave you with a taste of what it’s like to go on these ‘7 Walt Disney World Resorts in 7 Days‘ tours with us. Craig insisted on getting the largest Dole Whip possible, and then ate it without even putting his camera down. 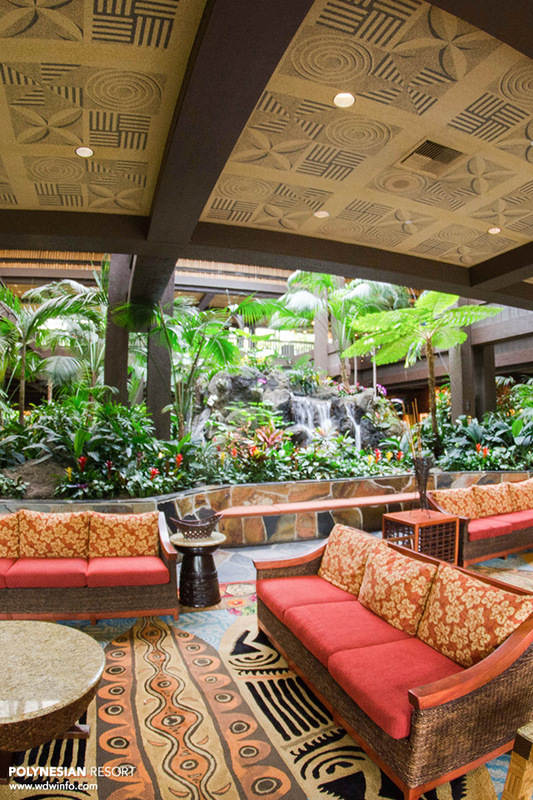 For our wallpaper today, it’s a view of one of the best spots to relax at Disney’s Polynesian Resort. You can download for your computer, iPhone, or iPad. Enjoy! Thanks for the great review of the Polynesian Resort. Which building name or number should I request when making a reservation if I want to stay in one of the renovated rooms? I haven’t stayed there in years and read many reviews saying that a lot of the rooms were in need of makeovers.